Sonny the Cuckoo Bird, the mascot for Cocoa Puffs, has been "coo-coo for Cocoa Puffs" since he was first created and voiced in the early 1960's. His trademark catchphrase has become so ingrained in American culture that it is now used as slang for "insane". 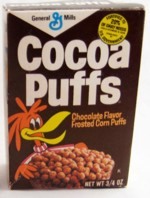 When introduced, Cocoa Puffs was basically sweetened, chocolate-flavored Kix cereal. In the mid-50's, General Mill also created Trix cereal and Sugar Jets cereal by enhancing the corn puff pieces associated with Kix. With his catch phrase, "I'm cuckoo for Cocoa Puffs", Sonny was an instant hit when he appeared in his first commercial for Cocoa Puffs in 1963. Within two years, the cockoo replaced The Cocoa Puff Kids on boxes of the cereal, where he has remained a permanent fixture ever since. These are the most recent images. Click here to see all pictures for Cocoa Puffs. What do you think of Cocoa Puffs? View all 31 comments for this cereal. 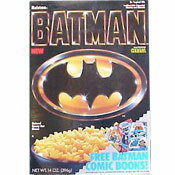 I loved this cereal when I was kid and the commercials were great. The gold standard of chocolate cereals. There is simply none better. From time to time I'll buy a box of Cocoa Puffs. While they are still pretty good, they aren't like they were when I was a kid. Back then, they had a light coating of sugar, which made them incredibly tasty. 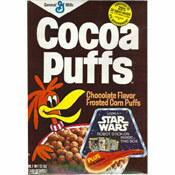 I would love to just once more, have a bowl of those original Cocoa Puffs. I love chocolate for breakfast. Classic. I love this cereal so much! I need more facts for this cereal. I'm doing a bunch of research on the history of this. Yo, Cocoa Puffs are mah boi (my boy)! That is to say, I like them! Loved them growing up in the 70's. Still occasionally have them in my cupboard. Always loved it when I was a kid. Let 'em soak in the milk for 10 minutes or so. So tasty.